Persistence Market Research offers an eight-yeFar forecast for the global sterols market between 2018 and 2026. The global sterols market is expected to register a CAGR of 7.4% during the forecast period. The primary objective of the report is to offer insights on the advancements and opportunity in the sterols market. The study demonstrates in-depth analysis of the key market dynamics, which are expected to influence the market performance in the long run. The current status, most impactful challenges, and future prospects associated with the global sterols market have been examined over the course of assessment period. The report also offer updates on recent trends, key drivers and restraints, volume and value forecasts, and highly important opportunities for manufacturers operating in the global and regional sterols market. Growing health concerns have resulted in the increased demand for functional food and dietary supplement products over the last few years. Food ingredient manufacturing companies have also shown keen interest in enhancing their market presence by increasing the production capacities of existing plants and new product development. In 2015, BASF Corporation increased its sterol extraction capacity in Boussens, France, to meet the increasing demand for sterol in the global market, as typically, it has high a demand among dietary supplements, functional food, and other food products as a functional ingredient in food and beverages to reduce cholesterol. By source, the sterols market is segmented into vegetable and pine trees. The vegetable oil is further sub-segment into soybean oil, corn oil, cottonseed oil, sunflower oil, rapeseed oil and others. Among both the segment pine trees segment is likely to be the most attractive segment in the forecast period. On the basis of form, the sterols market can be segmented into powder and granular segment. The powder segment is estimated to account for a significant revenue share of 64.1% in 2018 and is expected to register significant growth rate during the forecast period. By end-use, the sterols market is segmented into food, pharmaceuticals, cosmetics, dietary supplements, and others. The dietary supplement segment is likely to be the most attractive segment in the forecast period followed by food segment. Furthermore, food segment is further sub-segmented as dairy products, sauces & dressings, beverages, bakery & confectionery and others. Amongst these sub-segments, the sauces & dressings is anticipated to occupy the largest market share of 26.8% in 2018. The report includes market share of each segment according to the region with analysis towards market trends respectively. A section of the report highlights Sterols demand. It also provides a market outlook for 2018–2026 and sets the forecast within the context of the Sterols ecosystem, including the new product developments as well as product offerings in the global Sterols market. This study discusses key trends contributing to growth of the global Sterols market, as well as analyses the degree to which drivers are influencing the global market. In the final section of the report, a competitive landscape has been included to provide report audiences with a dashboard view. Key categories of providers covered in the report are Sterols’ key players of the global Sterols market. Detailed profiles of the providers are also included in the scope of the report to evaluate their long-term and short-term strategies, key offerings and recent developments in the Sterols space. Key players in the global Sterols market includes The Archer Daniels Midland Company, BASF SE, Cargill, Inc., Raisio Plc , Xi'an Healthful Biotechnology Co., Ltd , Matrix Fine Sciences Pvt. Ltd., Vita-Solar Biotechnology Co., Ltd., COFCO Tech Bioengineering (Tianjin) Co., Ltd., DRT, Lipofoods SLU, Advanced Organic Materials , Arboris, LLC, Vitae Caps S.A., Gustav Parmentier GmbH, Nutrartis and others. Also, another key feature of this report is the analysis of all key segments in terms of absolute dollar. This is traditionally overlooked while forecasting the market. However, absolute dollar opportunity is critical in assessing the level of opportunity that a provider can look to achieve, as well as to identify potential resources from a sales and delivery perspective in the global sterols market. Growing health concerns have been responsible for elevating demand for functional food and dietary supplement products over the last few years. Food ingredient manufacturers are also enhancing their market presence through expanded production capacities of their existing plants. In addition, frequent new product development and launches mark an important move in terms of strengthening a footprint on a global level. Sterols represent a rapidly thriving industry, as the demand for dietary supplements, functional food products, and healthy food ingredients continues to increase predominantly to reduce the level of cholesterol in blood. 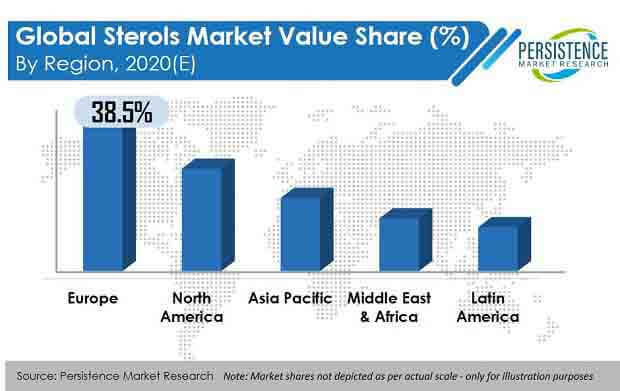 The global sterols market, which currently valuates roughly to US$ 755 Mn, is expected to take a leap to reach beyond US$ 1,300 Mn by the end of 2026. As indicated by a recently conducted research by Persistence Market Research, the global market for sterols will exhibit robust growth at 7.4% CAGR over the projection period, 2018-2026. Demographic changes in developing economies, increasing life expectancy, and growing awareness about maintaining a healthy lifestyle will continue to stimulate the demand for sterols. The market is likely to witness a major impetus, as health care professionals, researchers, government entities, and functional food manufacturers strive to meet consumer demand for sterols and derived products. Food industry is presumed to continue presenting the maximum growth opportunities to sterol manufacturers, retaining the top end user position. However, growing expert recommendation and popularity of functional foods is likely to create a scenario with neck-and-neck competition between food and dietary supplements, in terms of sterol consumption. Dairy products, followed by sauces and dressings, will reportedly register robust consumption of sterols. Bakery and confectionary, and beverages are also expected to grow into attractive food segments, accounting for substantially increasing sterol consumption rate. Dietary supplements are anticipated to take over the food industry through 2026, in terms of growth rate. Over 550 million people are aged 65 years or older as per a recent survey, which translates to roughly 8% of the world’s population. Over the next thirty years, the number of people aged sixty years or above will increase thrice as much, and is projected to surpass 1.5 billion - representing over 15% of the global population. While developed countries have the highest geriatric population profiles, developing economies have a substantially large chunk of the population moving to a geriatric population group. Since age remains a primary factor that fosters the susceptibility of acquiring chronic health conditions, an expanding elderly population is poised to continue the optimistic growth prospects for the sterols market over the forecast period. There will be an increase in the demand for food products containing sterols, as consumers are seeking preventive measures rather than choosing a cure. More than a quarter of the Japanese population is over the age of 60 years, which is one of the key factors creating a lucrative market for sterol-based product manufacturers in this region. Matrix Fine Sciences Pvt. Ltd.